If you’re looking for information on Chat Roulette, the random online video chat service that was all the rage in 2010, this is not the post for you. Sorry, no NSFW content here. Today, we’re talking about REAL video roulette— one of the many video versions of classic casino games, that involves winning money as opposed to watching strangers do really strange things. Video roulette is a lot like regular casino roulette. The difference? It’s played entirely online. To play video roulette, you’ll first need a giant stack of chips. You can grab chips by making a deposit (Hint: if your online casino site has a bonus, take advantage of it and bring more to the video roulette table). 1) You place your bets by stacking chips on the outside, on the inside, or both. If you decide to play the outside, you can bet on evens/odds, black/red, or whether the ball will land on a number that sits in the 1st group, 2nd group, or 3rd group of numbers. If you decide to play the inside, you’re betting that a specific number pops up. You can also bet on groupings of numbers. Note that numbers on individual numbers usually payout at 30:1 whereas payouts for groupings of numbers are lower. 2) The dealer spins the ball along the roulette wheel and waits. In a land-based casino, you’re usually free to continue betting while the wheel is spinning. You’ll know when to stop when the dealer shouts, “No more bets!” However, in video roulette, you’ll most likely have to stop betting once the wheel starts spinning. 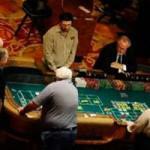 The rule varies from online casino to online casino so consult your video roulette rules before playing. 3) Once the ball drops, the video roulette dealer pays out players based on whether their bet worked out. If you’ve bet on even and the ball lands on an even number, you win. But here’s where it gets tricky. If the ball lands on zero or double zero, don’t get too excited. Despite what you learned in math, zero is not considered to be an even number. That’s where the house gets its edge. The only way you can win on zero or double zero is if you’ve bet on it. That’s really all there is to video roulette. It’s one of the easiest games to learn, and it’s a great game for testing out a betting strategy.